A few weeks ago, Andrew and I returned from our honeymoon in Canada. Of everything I was looking forward to about the wedding, our time in the Great White North was at the top of that list. 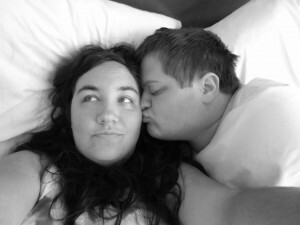 I dreamed about it, talked about it, planned for it, and basically kept the thought of our honeymoon within easy reach. 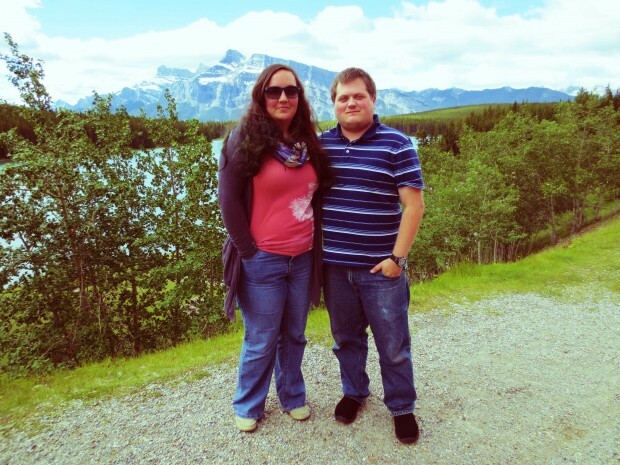 So much so that Andrew and I started a mantra to get us through any mishaps that arose at the wedding, “We still get to go to Canada.” It meant that even if the whole day was a disaster, we would still get to enjoy a picturesque honeymoon in the Rockies. We were fortunate that our departure was not right after the wedding. It gave us time to prepare and make sure we had everything we needed. Plus it gave us some cool down time from the crazy week we had just finished. We left on a Thursday, early in the morning. Really, really early. However we had yet to learn what early departure was until the return trip, but still, it was early. What was really nice though, was the fact we had door to door service; benefits of doing a guided tour. I recommend doing at least one group tour in your life. You will be glad you did despite the stereotypes you see in the movies about guided tours. Yes, the majority of people on guided tours tend to be grandparent age, but that makes them no less interesting to be around. I personally love my grandparents and it was like being on a week long vacation with 35 grandparents, all of them doting on and teasing us about our newly wed status. We left that trip with arm fulls of advice, anecdotes, and well wishes. There is a richness added to conversations when the people you are having them with have seen and experienced so much more than you and are willing to pass on their wisdom and humor. Our first night was in Vancouver. I fell in love instantly with the lively city. It had everything I imagine in my ideal living space; the ocean, the mountains, rain, sunshine, mild temperature , nature everywhere, and beautiful architecture. I was sad we only got to spend a day and a half in the city. I have a feeling we could make an entire vacation in Vancouver and still have much to do. That (image above) was the view from our room! We walked around on our own that first night, exploring and hunting down dinner. When we came back room service stopped by to give us this adorable plate filled with all kinds of treats; raspberries, blueberries, chocolate, and some strange fruit I’ve never seen before. Drizzled in chocolate was ‘Happy Honeymoon’. We spent the next day meeting the people we would be spending the next 10 days with and getting a tour of the lovely city. Our guide, Geoff, was very knowledgable and personable. He really made the whole experience personalized despite the fact there were 40 of us on the tour. We went by Stanley Park, one of the largest city parks in Canada. 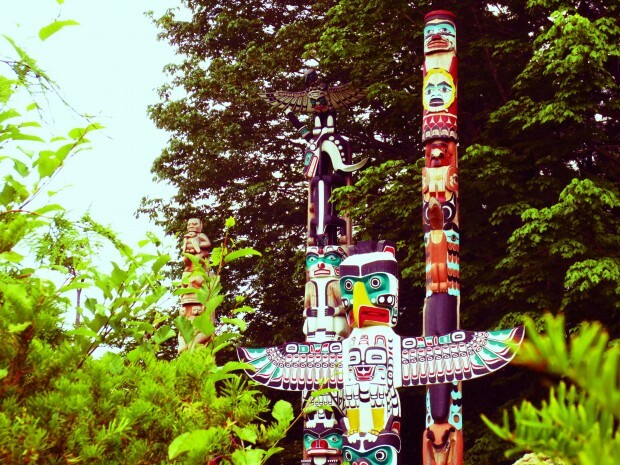 The big attraction in Stanley Park is the totem poles. We got to stop by and take some pictures. 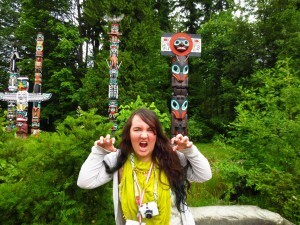 Each of the totems had a marble slab telling the history of its origins and the meanings each animal had in the story. I find it fascinating what Canadians call their native people. First Nations People. I know, as with our own history, relations between those who came to Canada and the indigenous people were often times violent and tragic, there seemed to be such a blending of the cultures now and a reverence when speaking of the First Nations People that I feel is lacking in America with regards to Native Americans. After Stanley Park we got to spend the day downtown shopping and exploring. Andrew and I found this small pizza place and enjoyed our cheapest meal of the whole trip. Two slices of pizza and a can of soda for 5 bucks each. We were picked up early that afternoon in time for the rest of our Vancouver tour and dinner. The way dinner worked was we signed up for what we wanted to eat at the meals that were included in the tour package, then we were paired with another couple (not always a husband and wife since there were a few people who came solo) and we ate four to a table. It worked out that we never ate with the same couple twice for dinner. We did share a few breakfast meals with the same people which made for more comfortable conversation. After dinner we headed out for the train station. We got to take a train cross country, from Vancouver to Jasper. I’ve never experienced a sleeper car before and I admit I was giddy with excitement. Of course I forgot to charge the digital camera so the only shots I got of the train were on film. A lot of the older people were a little put off by the size of the rooms and the fact they had to climb up into their beds when they were lowered. We lucked out with the largest room and beds that formed an L shape. No climbing for us. We ate two meals on the train before arriving in Jasper. My sharpest memory of riding on the train was a brief moment during the night. We’d already turned in for the night, lulled into slumber by the rhythmic sway of the car and opting to leave the shutter open on the window so we could see the countryside, when a sound woke me. I opened my eyes to a magical world. Half dazed by the remnants of a dream I saw the landscape before me like one would an imagined place. We were running alongside a wide and rapid river which was awash in the beautiful glow of moonlight, turning it into molten silver. I stared in wonder for what felt like an hour, mountains rushing past, before sleep overcame me again and I returned to my dreams. Our time in Jasper was nice and relaxed. 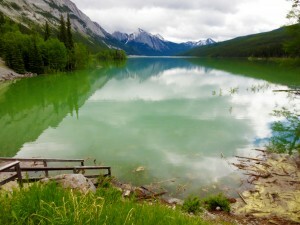 We trekked out into the wilderness to see glacier fed lakes, got to take a boat out to Spirit Island, and enjoyed breakfast by the tranquil Maligne Lake. On our way back to the hotel, the first day we were in Jasper, we stopped by Medicine Lake so called for the lore that surrounded the lake because of the unusual way the water level would rise and fall rapidly. When we got back into town there was a parade going on. 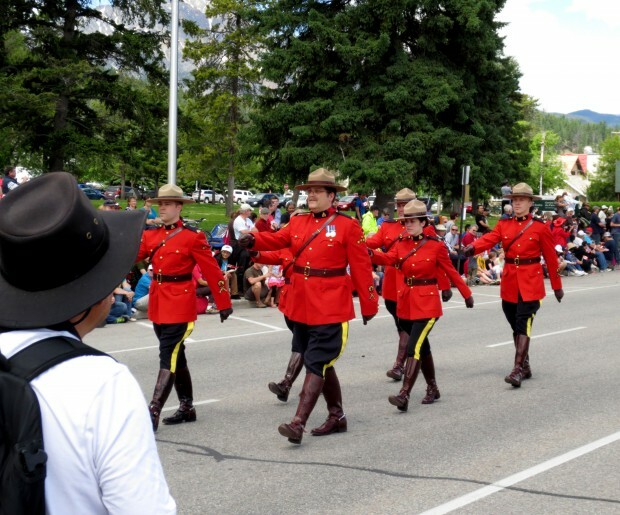 It was Canada Day so we got to see the Canadian Mounties in traditional garb! It also explained why the evening before Andrew and I heard bagpipes at 11 o’clock at night. A full Scottish troupe came down the street not far behind the Mounties, blaring a festive tune. Thanks to Andrew’s ingenious suggestion we darted into a pizza place right as the parade was starting. There were no lines for food and we got to sit in the window and watch the rest of the parade. When it was finally over there was a mad dash for food but we skipped all the long lines and hassle. From Jasper we made our way to Banff. This was the part of the trip I was most looking forward to. 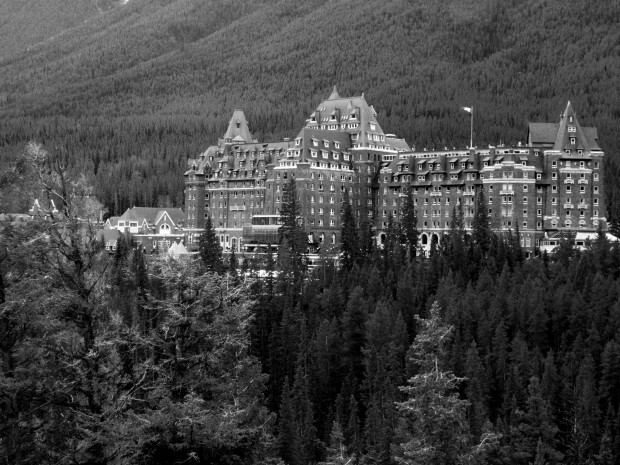 What inspired the trip to Canada was this picture in a honeymoon location extra I’d gotten in one of my Bride’s magazines of the Fairmont Chateau Lake Louise. It is a fairytale castle set in the mountains at the edge of a glacier fed lake. When we arrived I couldn’t believe I was standing there. Two years prior I had looked at the picture and now I was standing in the very place that had first made my heart race. 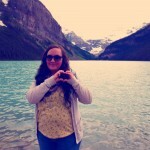 I was sad we only got one day at the Fairmont Chateau Lake Louise. I could have stayed there the rest of the trip. Of course that was because we hadn’t been to Banff Springs yet, but more on that later. The walkway along Lake Louise went right up to the water’s edge, which meant if I stood just right and looked out towards the glacier I felt as though I stood atop the very lake itself. We had our first of our fancy dinners at the Chateau and of course, free alcohol because, when asked what brought us to Canada, we told them it was our honeymoon. There were a lot of little honeymoon perks waiting for us at each hotel. First the treat tray, then champagne in each of the Fairmonts. As much as we could we spent time sitting by the lake. Had we more time I would have demanded we hike around it. The whole resort was covered in flowers, one of them being Iceland Poppies, and I have since adopted it as my favorite flower next to Foxglove. Which, by the way, seems to grow in leaps and bounds there! I’ve tried for years to get Foxglove to grow for me and they have it wild up there. One of the stops we made on the train was this little station in the mountains where the flower was everywhere! Mixed with the heavily saturated colors due to the rain the purples and yellows popped out vibrantly. In fact, nearly every city, town, and collective of houses we set foot into was lush with color and pulsing with nature’s beauty. It was a welcome sight since Andrew and I spend 90 percent of the year on land that is struggling to remain green. We get a little burst of color for a few weeks in spring, then everything pulls back into itself to survive the harsh summer. 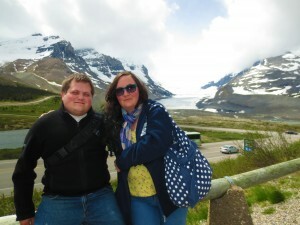 One of the coolest excursions we got to do was to walk on the Athabasca glacier! One, I’ve never seen a glacier in person let along walked on one and two, it was strange having come from the rising heat in Texas to the ice cold of a frozen mountain side. We saw so many different glaciers I can hardly keep them straight in my head. The Athabasca glacier is the only easily accessible glacier and is in fact a unique place in and of itself. The water from that glacier is the only one known to flow into three separate seas. I don’t think I’ve ever eaten so well as I did on this trip. Most of our meals were covered per the package deal and so at the fancy four and five start hotels we got matching meals. And thank goodness, cause we could NOT have afforded the dinners otherwise. We ate three full meals every single day. Even breakfast was a feast! Every other hotel breakfast will look paltry in comparison from this moment forward. That is, unless we manage to stay at a fancy resort. I really think that the allure of eating food while on vacation and feeling like there is no such thing as great food where you live, comes purely from the places you choose to eat. 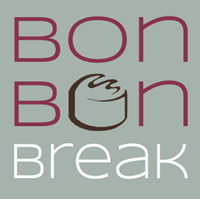 When treated with gourmet food all other food dims in the blinding goodness. You feel like you haven’t known what it means to taste until that morsel touched your tongue. We were also fortunate to have lots of animals sightings. Black bears, elk, deer, mountain goats, adorable chipmunks who chased each other around, and even an eagle. 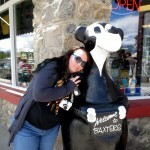 During the trip I became obsessed with black bears and had to pose with all the black bear statues we came across. There are a lot of shots of my being chummy with those guys. I did, however, get a funny picture of Andrew pretending to run from one of the statues. We left the Fairmont Chateau Lake Louise for the illustrious Fairmont Banff Springs, also known as the Castle in the Rockies. As much as I was looking forward to and loved the Chateau Lake Louise, my breath was swept away at the sight of the Banff Springs. Would that I could call that place home! Not only was the hotel like something from a storybook, but the town couldn’t have been more picturesque. Cradled in the dip between several mountains Banff could have easily stepped from my dreams. Sadly no one can live in Banff unless they work in the town (or their parents do if you’re underage) so I would have to live out my life there in the tourist business which might make me insane. Two days we got in Banff and they were two of my favorite days of the whole trip. We got to explore the downtown area, enjoy fine cuisine, lounge in a castle (!) and tour the nature around the area. 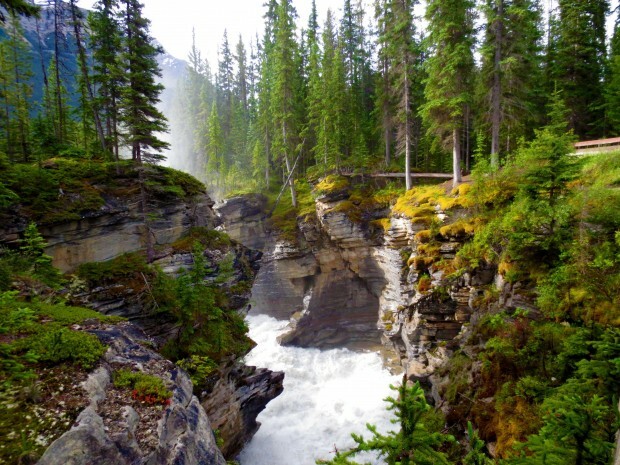 Interesting fact: people cannot own the land in Banff. They can own the houses but they have to lease the land. Typically the lease is for 99 years. 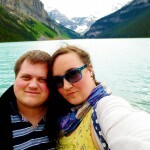 We did a lot of shopping in Banff too, hehe. I bought several skeins of alpaca yarn dyed the most beautiful dusty rose and maroon, we got a few friends some gifts, and even picked up Andrew’s required shot glass. He gets one every where we travel. This trip saw us three shot glasses heavier. The top image is the view from our room! I think the Westin Bayshore (the first hotel we stayed in) tied with the Fairmont Banff Springs for best view. I spent several hours reading in the little window seat they had and would, from time to time, look up and daydream about life in the mountains. See, I am a mountain girl at heart. I look upon the face of those towering behemoths and feel alive, I feel connected to the world in a very spiritual way. Their silent vigilance has seen the ages. Oh, to see what they have seen, to be molded by the rough hands of a river, to be covered in a mantle of pure snow, have wildlife nestle into my bosom; I think it would be amazing to be the soul of a mountain. There are many who do not seem to grasp how a place can seize one’s heart and lay claim to it. They do not understand that there is where you were born and where your soul is meant to live. It is a topic Andrew and I discuss all the time. He is of one mind and I am of another. Most likely because he lives where his soul is meant to call home but I hope to one day convince him that we need to live near the mountains. In the meantime I will let him try his best to convince me that the restlessness I feel in my home town is purely due to the fact I need to travel more by taking me on all kinds of trips. Calgary was our next and final stop, which made me sad. I tend to get really depressed at the end of a trip and for about a week after, because going back to the daily grind is so hard, plus any plunge in adrenaline can make one feel sick and moody. Before we made it into the city we got to spend our last afternoon on a ranch where it felt a little like we’d stepped back into familiar ground. We ate BBQ and got a hayride around the land where we got to see baby bison! Our stop in Calgary was uneventful. We only had a few hours before we needed to turn in because we had a 3 am bag pull and 3:30 departure for the airport. We grabbed our last pizza of the vacation and with the curtains pulled tight to block out the light we watched Jackie Chan in Super Cop. Canada is one place I plan on returning too. I loved nearly every minute of our honeymoon and couldn’t have imagined spending it with anyone else. It was truly a magical experience. 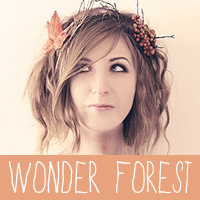 I was filled with wonder, shock, intrigue, knowledge, excitement, and romance. We have Andrew’s parents to thank for making this possible. They used their time share points with the Marriott to book this trip for us. 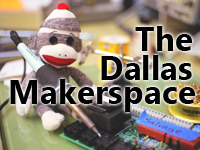 Everything that we were able to do would have been extremely hard to book and plan were we to have done it ourselves. I got my dream honeymoon with my dream guy. Could anything be better? If you had to do it again would you do the train? 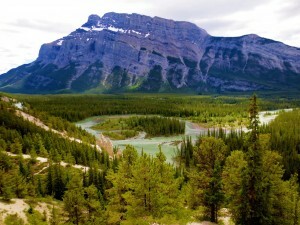 Or would you just stay in banff? An was the train something a honeymoon couple would enjoy? (If you know what I mean) Also which train company did you go with? I would do the train again in a heart beat. It was a lot of fun and surprisingly the motion was very soothing at night. Felt like being rocked to sleep but not so rocked you felt seasick. The beds are typically singles but we made it work :). I am not sure about the company cause we did it through a tour group.